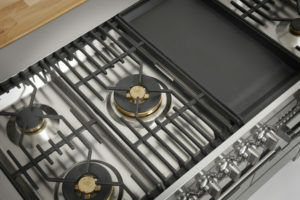 Steel – Stile in Cucine: Steel appliances at their best! We are really proud to be able to offer our customers a huge range of appliances that we believe to be the best that the industry has to offer, which is why we get so excited when a new catalogue appears telling us about the latest and best that our suppliers have to offer. 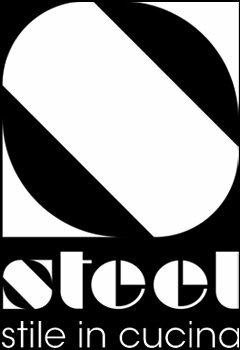 Today I’d like to tell you about one of our favourite companies; Steel-Stile in Cucina. This Italian company is run by a family in their 3rd generation of innovative design and technology of kitchen appliances. 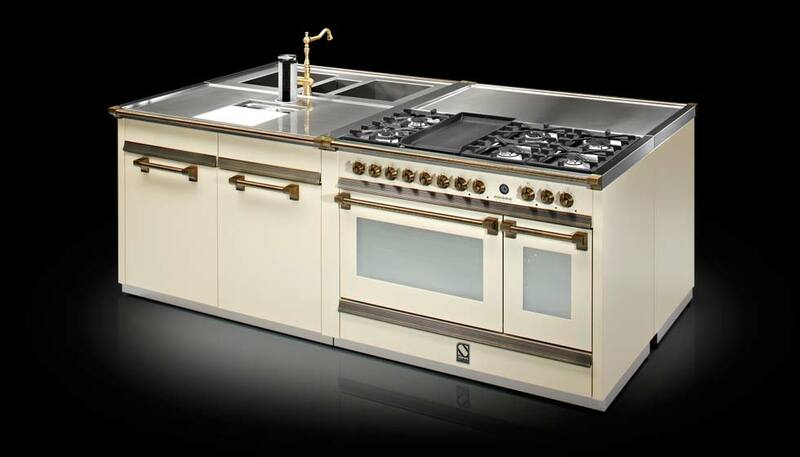 The original company was set up by Angelo Po in 1922 and his craftsmanship in stainless steel helped to produce the first hand made stoves and later, the production of high quality appliances for restaurants. When a company are so committed to excellence, not only in producing appliances for the family home, but also for restaurants, you know you are dealing with true professionals. We recently received the latest catalogue for Steel and are very excited by the products, especially the news that they have extended their range of appliances to provide steel kitchen furniture which matches the ovens, hoods and fridges beautifully! All the appliances available are made from steel and are excellent quality, with each range manufactured by just two people who are committed to perfection. The ranges feature appliances with a huge choice of options to make your cooking experience as easy and personal as possible. 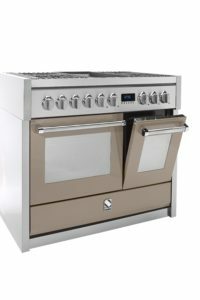 The Genesi Range Oven, for example, can come with a choice of different cooker tops featuring any number of gas burners, a deep fryer, a mega wok, a lavastone grill or a complete induction hob. A unique collection of products to Steel are the ‘French-door’ fridges, with double doors over a single or double drawer freezer. What makes these products so unusual is that they can be perfectly colour-matched to the other products in the Steel range – something almost unheard of in the world of fridges! Steel also produce a 70cm wide model with double doors, which, as far as we are aware, has never been done before. 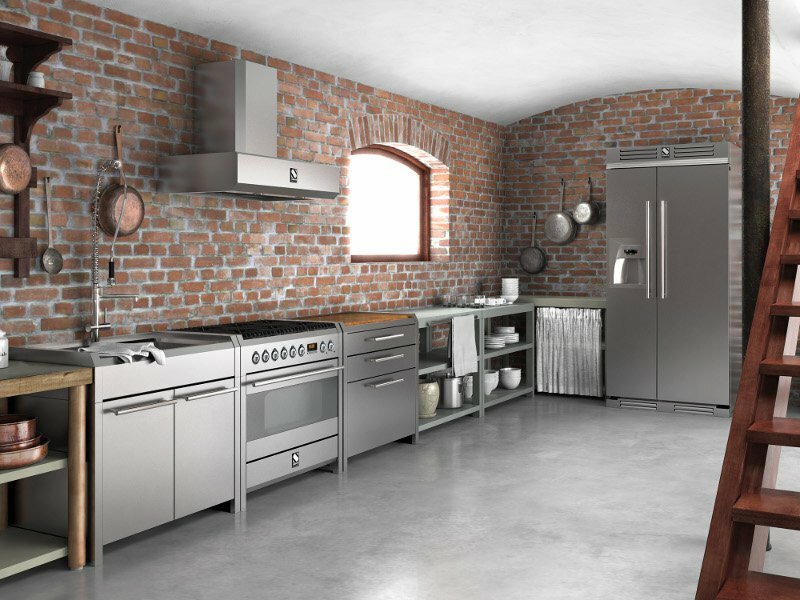 Steel have produced a ‘modular system’ for their appliance ranges, which feature steel units for food preparation and washing, large storage compartments with drawers or cupboards, wall units, stainless steel sinks and preparation tables – as well as the option to have appliances built-in or freestanding. While the setup of these components can feel rather like an industrial restaurant kitchen, the way the Steel kitchens stand out is through the range of colour choices you can customize the units with. 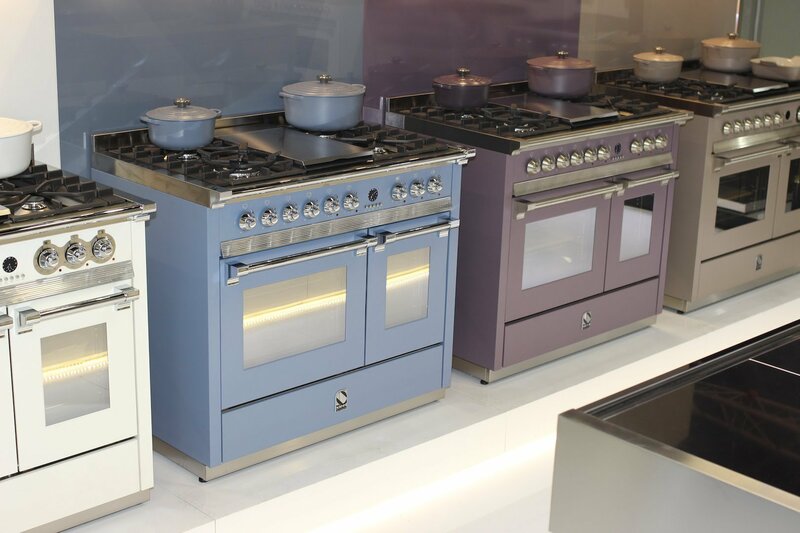 The pastel shades are very contemporary and really soften the ‘industrial’ feel of stainless steel and give the appliances and units a more ‘classic’ feel. Even better, when you buy an item from the Le Creuset colour set, you receive a 20cm cast iron cooking pan free in the matching colour (worth £150!) – Below is the Genesi oven in ‘Amethyst’ from the Le Creuset collection. Very kindly, Steel have created a few units which can house Siemens appliances, which is ideal for our customers as we are a Siemens IQ Design Studio and sell a huge range of these appliances! Extractors Part 2: Re-circulating, the green option. Beeck kitchens – Flexibility at its finest.